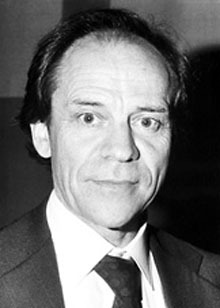 Swedish-born American neurobiologist Torsten N. Wiesel was raised at Beckomberga Hospital, the mental institute where his father was chief psychiatrist. He described himself as a lazy student until his late teens, before embarking on a career of research into the physiology of vision. Wiesel was awarded the Nobel Prize for Medicine in 1981, along with his long-time collaborator David H. Hubel, for mapping the visual or striate cortex, the posterior section of the cerebral cortex. Roger W. Sperry shared that year's Nobel honors, for work conducted at CalTech. Wiesel also demonstrated the importance of early diagnosis of childhood visual problems. When a reporter informed him he had won the Nobel Prize, Wiesel's first response was, "Oh, no, I was afraid of that", explaining that he feared the hubbub might prove a distraction from his work. In the 1990s he was President of Rockefeller University, and since 2000, he has been Secretary-General of the Human Frontier Science Program, a group which supports collaboration across different scientific fields. He also served more than a decade as Chair of the Human Rights Committee for the National Academy of Sciences. In 2001, he was named to a high-level post at the National Institutes of Health, but his nomination was scuttled by then-Secretary of Health and Human Services Tommy Thompson, with the official explanation that he had "signed too many full-page letters in the New York Times critical of President Bush." Wiesel responded, "I have not signed a statement against Bush, but nonetheless for some reason I am on the administration's blacklist. Perhaps [it is because of] my human rights activities and being contrary in general."